We are packing up some of our most exciting work and heading to Santa Monica, CA for photo l.a.! I thought I would post a little teaser to encourage you to stop by our booth (B-205) and say hello to Rixon, Vicki and myself. If you have not attended photo l.a. in the past I encourage you to do so especially as it is now in its 20th year. (Congratulations to Stephen Cohen and the Art Fairs Inc crew!) This year photo l.a. will feature work from about 55 of the finest photography galleries from all over the world. photo-eye will be showing work by 5 gallery artists and a photographer we selected from photo-eye's online gallery the Photographer's Showcase, Collette Campbell-Jones. We will also be showing the first few publications from photo-eye Editions, including Habitat Machines by David Trautrimas, Suo Sarumawashi by Hiroshi Watanabe and Cranach Series by Carla van de Puttelaar. In September 2010 Brandt took his love for the animals to the next level by starting Big Life Foundation -- its mission to help conserve and protect East Africa's endangered wildlife and ecosystems. 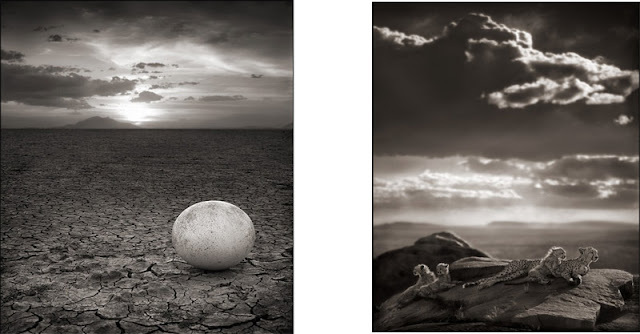 Through January 31, 2011, 20% of all Nick Brandt photograph sales through photo-eye will go to the Big Life Foundation to help protect the wildlife depicted in his images. Click here to read our recent blog post on Brandt's Big Life Foundation. View Brandt's work at photo-eye Gallery. We will be showing some of the most recent images from Julie Blackmon's on going Domestic Vacations series. Blackmon has been moving forward at full force continuing to produce intelligent, visually interesting, and entertaining images utilizing family members in scenes that are inspired by classical Dutch and Flemish paintings. Blackmon's images are surreal yet ever day and contain modern day iconography, but visit classical compositions. Though I have studied all of Blackmon's images carefully I continue to discover new elements daily. View Blackmon's work at photo-eye Gallery. photo-eye showed Tom Chambers' work at photo l.a. for the first time about 5 years ago. Since then Chambers has continued to move us with his fantastic compositions. This year we will show Chambers' newest work Dreaming in Reverse / Soñando Hacia Atrás. Read the photo-eye Blog post on Tom Chambers' new series here. View Chambers' work at photo-eye Gallery. I think that it is safe to say that the bridge at Hoover Dam continued to hold Jamey Stillings' imagination beyond the end of the construction. 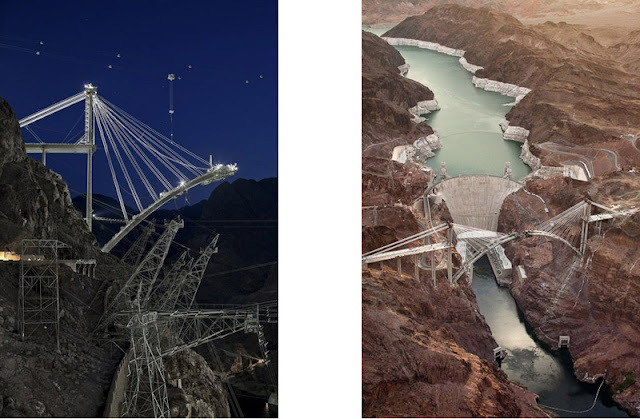 Stillings (who lives in Santa Fe) photographed the last 30 months of the bridge's construction and prepared a 40 print exhibition which opened at the Springs Preserve in Nevada in conjunction with the opening of the bridge! This exhibit is scheduled to travel for the next two years, and Stillings has a few other ideas in the works as well. Additionally, Stillings is a Photolucida Critical Mass 2010 Book Award Finalist. View Stillings' work at photo-eye Gallery. Dutch artist Carla van de Puttelaar creates beautiful timeless images of women in their natural state. According to van de Puttelaar, the images that we see in magazines are more about makeup and fashion - they are plastic, not about real beauty. For van de Puttelaar, beauty resides in the "little things," small imperfections or tiny movements. She defines this as a very human beauty. van de Puttelaar seeks to create images that capture "beauty with dignity" by focusing on distinguishing marks like small moles, imprints from lingerie lace or elastic or a slight bruise. To van de Puttelaar each portrait is, in a sense, a self-portrait as she relates to her models as a woman. Read my conversation with Carla van de Puttelaar here. View van de Puttelaar's work at photo-eye Gallery. Colette Campbell-Jones recently received her MFA from San Francisco Art Institute. A few years ago I reviewed her work at the Photo Alliance One World portfolio review in San Francisco. With in minutes of viewing Campbell-Jones' Stories from the Underground I knew that she was on to something very special. An exhibition of Campbell-Jones' work is currently on display at Palo Alto Center for the Arts. "The underground imagery of the mine is profoundly mythical, an archetype associated with darkness, the unknown and the primordial. Stories from Underground reveal the strange light of a people who have emerged from the mine's conditions of incommensurable darkness, from the Abyss." --Collette Campbell-Jones. Read the blog post on Campbell-Jones here. View Campbell-Jones' work on the Photographer's Showcase. We hope you'll join us to celebrate the 20th year of this prestigious international art exposition. 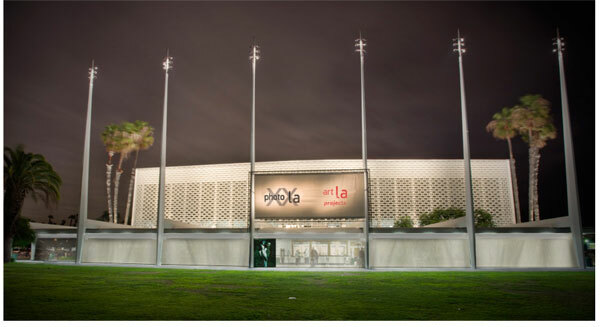 photo l.a. is being held at the Santa Monica Civic Center located at 1855 Main Street, Santa Monica, CA. The fair dates are January 14th-17th with an opening reception on January 13th from 6-9 pm. Opening night tickets are $80 and benefit the Wallis Annenburg Photography Department at LACMA. Check out the photo l.a. website for the full schedule of events and lectures. Please feel free to contact me should you have questions or visit the photo l.a. website.